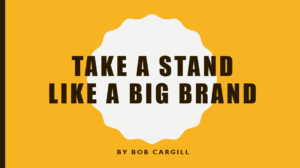 I think it’s incumbent upon brands and businesses to speak up for what they believe in…not just on behalf of sales. It doesn’t matter how they feel about the issue. What matters is that they realize they have the platform and the responsibility to say something…as long as they believe they can make a positive contribution to the dialogue. The marketer in me thinks this may even help, not hurt Nike’s revenue. But much more important, as a human being, I have greater respect for those who are authentic, transparent, open and honest. People do business with people, not corporate logos. Iconic swoosh or not, Nike just let consumers know that they are just like us. Like it or not, they dared express an opinion and join the conversation. In this day and age, that’s more part and parcel of marketing than we may realize. In the very near future, that just may be the norm, not the outlier. Good for Nike. Good for America…if you ask me.